There are several ways you can help your child with their anxiety levels. Does your child experience high levels of anxiety on a regular basis? If this is the case, do not think your child is alone because this is a fairly common problem for children. That being said, here are some helpful tips for helping your child with their anxiety levels. Many parents have some go-to phrases when their children are feeling anxious. Some of which include, “Everything is going to be okay” and “There is no need to worry.” Believe it or not, reassuring a child that their situation is fine and they have nothing to worry about is not necessarily going to help your child feel better. Although a child trusts you and wants to believe what you are saying is true, they can’t always control themselves to think logical manner. A little stress in our lives is a good thing. 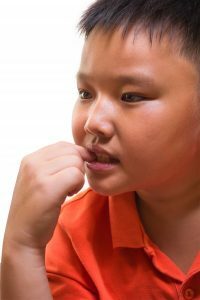 Although it is not good for a young child to experience high levels of anxiety on a daily basis, it can be beneficial to let a child get it out of their system every so often. You could go as far as setting up a time each day where a child is allowed to stress and worry about the things that are bothering them. It is also a healthy exercise for a child to write out all their worries down on paper and keep these writings in a secure location. Children experience anxiety for a variety of reasons. It is possible they struggle on a social level and have a hard time interacting with other children their age. The fear of not having friends has always been a common fear of children. Sometimes, a parent may need to step in and encourage the child to face the stressors in their life face-on. If your child is nervous about interacting with other children, it may be a good idea to try and arrange some playdates with some of the other parents. This entry was posted on Friday, December 15th, 2017	at 3:08 pm	. You can follow any responses to this entry through the RSS 2.0 feed. Both comments and pings are currently closed.